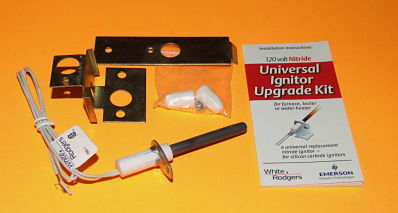 120 Volt Nitride Universal Ignitor Upgrade Kit. Universal replacement Nitride Ignitor for Silicon Carbide Ignitors. Replaces Part Numbers: 21D64-2; 21D642. Replaces American Standard Models: 340039P01; B138196P01; B144676P01; B144676P02; B340039P01; IGN23; IGN26: IGN30; IGN34 and many others. Replaces Armstrong Air Models: 38322B001 and many others. Replaces Bryant; Carrier; Day & Night; Payne Models: LH33ZS001A; LH33ZS002 and many others. Replaces Coleman; Evcon Models: 1474-051; 1474-052; 1474051; 1474052 and many others. Replaces Comfort Zone Models: 150114-04-01; 15011404-01; 150114-0401; 1501140401 and many others. Replaces Ducane Models: 20015201 and many others. Replaces Goodman Models: B14011009; B1401018S and many others. Replaces Heil Models: 1096048 and many others. Replaces Intercity Models: 1009604; 1096048 and many others. Replaces Intertherm; Nordyne Models: 105141000; 632-0880; 632-0770; 6320880; 6320770 and many others. Replaces Rheem; Ruud Models: 62-22441-01; 62-22868-82; 6222441-01; 62-2244101; 622244101; 6222868-82; 62-2286882; 622286882 and many others. Replaces Robertshaw Models: 41-402; 41-403; 41-404; 41-405; 41-406; 41-407; 41-408; 41-409; 41-410; 41-411; 41-412; 41-413; 41-414; 41402; 41403; 41404; 41405; 41406; 41407; 41408; 41409; 41410; 41411; 41412; 41413; 41414 and many others. Replaces Synder General Models: 1380654; 1380672; 1380680 and many others. Replaces Tempstar Models: 1096048 and many others. Replaces Trane Models: 340039P01; B138196P01; B144676P01; B144676P02; B340039P01; IGN23; IGN26: IGN30; IGN34 and many others. Replaces Weil McLain Models: 511-330-139; 511-330-188; 511-330-190; 511-330-193; 511330-139; 511-330139; 511330139; 511330-188; 511-330188; 511330188; 511330-190; 511-330190; 511330190; 511330-193; 511-330193; 511330193 and many others. Replaces White Rodgers Models: 767A-301; 767A-303; 767A-306; 767A-310; 767A-311; 767A-350; 767A-353; 767A-354; 767A-357; 767A-361; 767A-364; 767A-365; 767A-366; 767A-370; 767A-371; 767A-372; 767A-373; 767A-374; 767A-375; 767A-376; 767A-377; 767A-382; 767A-383; 767A-384; 767A301; 767A303; 767A306; 767A310; 767A311; 767A350; 767A353; 767A354; 767A357; 767A361; 767A364; 767A365; 767A366; 767A370; 767A371; 767A372; 767A373; 767A374; 767A375; 767A376; 767A377; 767A382; 767A383; 767A384 and many others. Replaces Williamson Models: 9050 and many others. Replaces York Models: 025-27766-000; 025-27774-000; 025-29043-000; 025-29050-000; 02527766-000; 025-27766000; 02527766000; 02527774-000; 025-27774000; 02527774000; 02529043-000; 025-29043000; 02529043000; 02529050-000; 025-29050000; 02529050000 and many others.